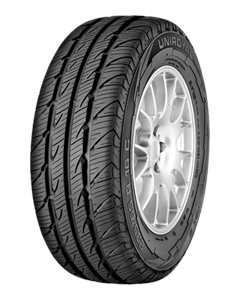 A tyre with excellent aquaplaning characteristics on wet roads as well as high braking performance on dry roads. The rain tyre for vans. The arrow shaped groove structure combined with three large circumferential channels promotes smooth water flow, resulting in excellent protection against aquaplaning. An increased number of sipes and gripping edges help cut through the water film with the windscreen wiper effect, resulting in excellent wet weather braking. Optimised stiffness in the tread ribs and lateral grooves gives even pressure distribution over the contact patch resulting in a long service life.